Traditional content management systems (CMS) like WordPress or Joomla is great but if you build a small website or a personal blog, you probably don’t need the rich functionalities offered. What you need is a simpler, more elegant and lightweight solution — what you need is a flat CMS. The most striking difference you will see in a flat CMS is that it does not require a database. A flat CMS stores any website data or content in files and folders only. Without querying to retrieve content from the database, you enjoy the rapid loading of your website. You can also skip the cumbersome installation process; simply upload files to the server and the website is ready. If you want to give flast CMS a try, here are 10 you can start with. Almost all of them feature a Markdown editor that can render your .md files into web pages. Some of them also feature a visual editor with WYSIWYG features as well as user and role management. 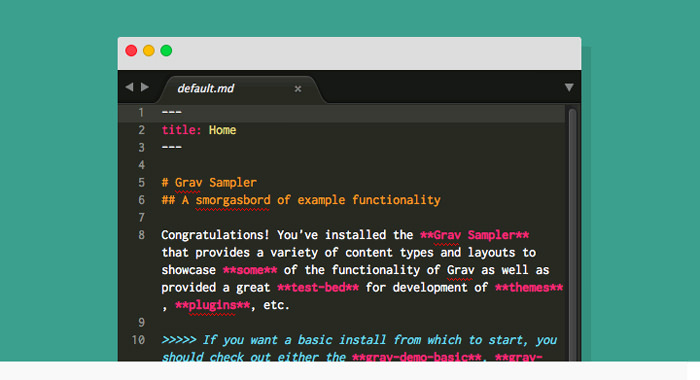 Grav reads the markdown files that you upload in the user/pages/ folder then renders it as pages. If you want to jump into it real quick, there are skeletons sites that you can use to kickstart your project. Grav uses the Twig template engine to build themes; you can create your own themes since it is quite simple or you can use any of the 20 ready themes. Grav also has many plugins to add extra functions to your site. For easy installation, you can use Grav Package Manager. Pico lets you create websites easily and blazing fast. You create content in .md files, then upload it to the content folder on the installation directory. That file will become an accessible page on your website. 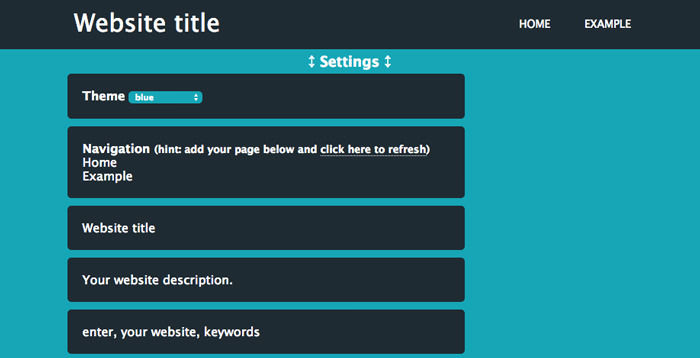 You can create your theme with the Twig template engine. There are also available plugins for pagination, slider, meta tag, and others to extend your website functionality. Dropplets is a simple CMS for easy blogging, with no database and easy installation in seconds to run on any server. It has an administrator page for setting site preferences, but not for editing content. To create content, write your post in Markdown format and upload it to the server from the dashboard by clicking Public or Update Posts. Dropplets comes with a free template, but if you want more, you can buy premium template from the dashboard. If you are designer and prefer to create your own theme, there is no special template engine, just use regular PHP. My favorite flat file CMS, Kirby has comprehensive features but is dead easy to use. Although you can add the content manually, like with other flat CMS, there is also a web interface named Kirby Panel, which lets you post your content as a page, blog, or gallery, as well as to manage the users and roles. Kirby lets you write content in Markdown format by default, but there are visual markdown editor plugins to make writing fun. You can browse more plugins to make your web more powerful and awesome. 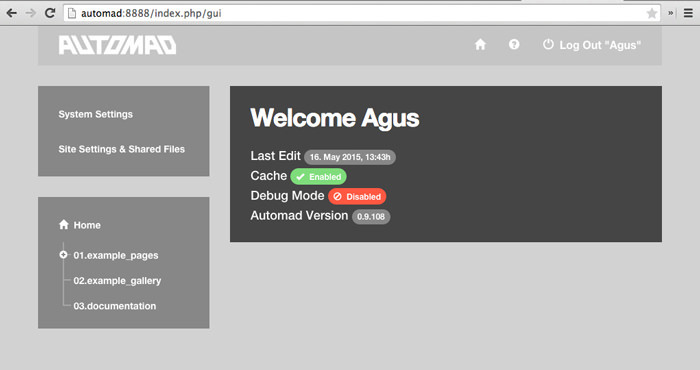 Automad is a file based CMS designed to run without any dependency to a database. You can add content that are text-based saved in .txt format and uploaded to the pages folder. 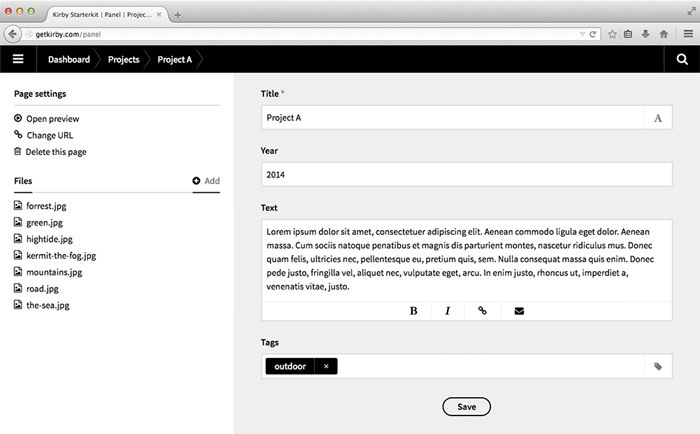 If you aren’t a fan of coding, you can use the web user interface instead to easily add content and a galleries. Automad use its own template engine to build themes, and it is easy to to use sincethey provide Toolbox functions to generate the elements in a page. gpEasy is a fast and easy to use flat-file CMS with many features included. The installation is easy, just follow these few steps to make your site ready. 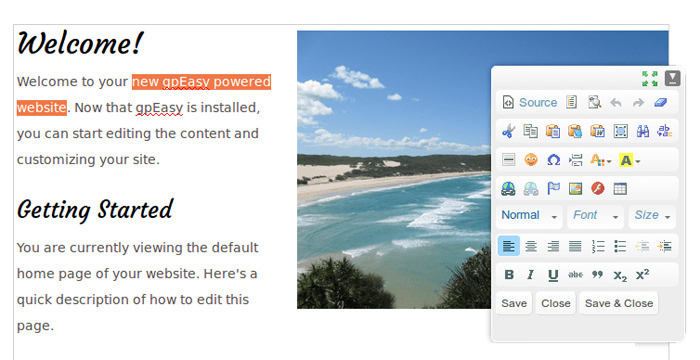 GpEasy comes with an WYSIWYG editor for easy adding and formatting of content. It also features a file manager so you can easily manage your media file or folder. In your post, you can insert images and other file types, such as PDF. Best of all, gpEasy comes with dozens of themes and plugins, more than what the other CMS has to offer. With Yellow you can write the content in .txt format, as well as in Markdown and HTML. When you do fresh installs, Yellow includes the “Home” and “About” page. Page is the default content. If you want make a blog then you can use a blog plugin; to insert images you should use the image plugin. 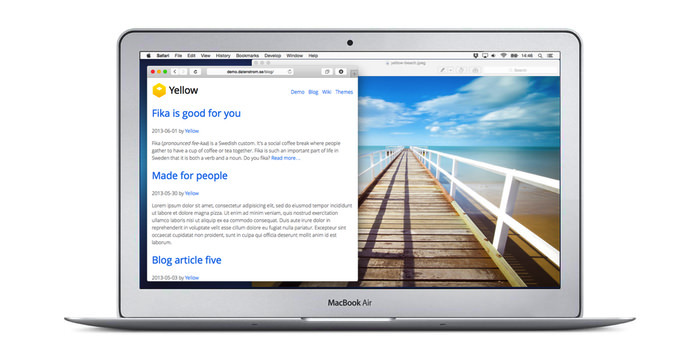 Yellow includes a simple online text editor so you can edit or add your content right on your website. You can also upload the file content manually, which allows you to set the sorting and publishing status. WonderCMS is the smallest CMS in the world (their claim). Its size is quite small (just 15kb on 7 files) yet it shas cool feature such as editing content in place. You can grab themes, and get plugins to add features to your site such as adding a gallery and a WYSIWYG editor. 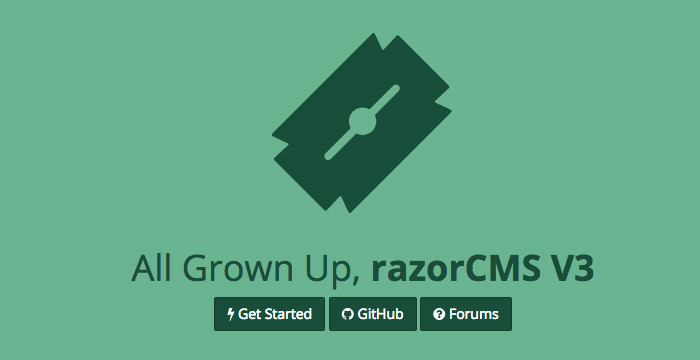 Razor is a flat file CMS that is easy to use even if you cannot code. To start up your site, after installation go to /login on your installation URL and insert the default credentials to access the dashboard. From there you can adjust the overall settings in your website, including adding or editing pages. The in-page editing with rich text editor is such a cool feature, which lets you edit the content just in one place. You can create your own theme to add flavor to the website. Nibbleblog uses a one-step installation wizard. All you need to do is fill in your information and you can login to the dashboard to do everything form creating a blog post or page to setting site preferences. You can formata the blog content easily since it comes wit h visual editor. You can also add the image or video there as well. There are about 9 ready-to-use themes to change the appearance of your site plus plugins to add special functions. Of course out there are still many Flat CMS created by other developers that you can use. I would like to add a few more of them for your reference or as alternatives should the list above not cut it for you.